The Dow is absolutely on a tear under President Trump. Equities were up and the stock exchange floor cheered wildly over a very strong earnings season. The Dow Jones industrial average hit a record high at its opening today, trading at 53 point higher. Boeing led the way… their shares were up .6 percent after announcing a record number of aircraft orders from India. Their quarterly results were much better than expected. The Nasdaq was also up .3 percent and the S&P 500 rose by .2 percent. It’s certainly happy days on Wall Street right now. 73 percent of the S&P 500 companies have reported that they have exceeded their estimates. That’s staggering. Talk about optimism. Oil prices have dropped and are now stabilized. The market keeps breaking record highs and there is no end in sight. 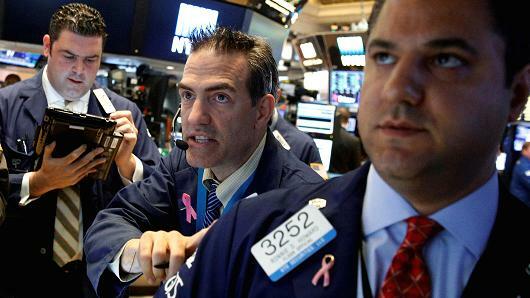 U.S. equities kicked off Monday’s session higher as Wall Street cheered on what’s been a strong earnings season. The Dow Jones industrial average hit a record high at the open and traded 53 points higher, with Boeing contributing the most gains. Boeing shares rose 0.6 percent after announcing it expects a record number of aircraft orders from India. The announcement came about a week after posted better-than-expected quarterly results. The S&P 500 rose 0.2 percent, with consumer discretionary leading advancers. The Nasdaq composite advanced 0.3 percent. This earnings season has largely provided positive surprises for investors. Seventy-three percent of the S&P 500 companies that had reported as of Friday had topped estimates on both the top and bottom lines, according to data from FactSet. These results, along with stabilizing oil prices and persistently subdued sovereign bond yields, have allowed the stock market to keep notching record highs, said Peter Cardillo, chief market economist at First Standard Financial. “We keep seeing political and geopolitical tension creeping up and the market seems to be taking that in stride,” Cardillo said. It’s very surprising as we are verging on the edge of war, not only with North Korea, but Iran, Russia and China. There has also been massive political upheaval in the White House power structure and the Obamacare repeal failed yet again. Even the tax repeal is not a solid thing yet, but Wall Street does not seemed bothered by all this… they are in the stratosphere and heading for the moon. This would definitely qualify as ‘winning’ under the Trump presidency. I just wonder if any of it is real and how bad it’s going to be if it all comes crashing down. The market may be at record highs, but so is our debt. Americans can also not subsist long under the crushing regulations and taxation that is being forced upon them. Let’s hope we get some relief from that and soon. “The markets are entering a historically weak seasonal period accompanied by rising investor optimism. Historically, the period from August through October has seen stocks struggle and a period when corrections have tended to occur most often,” Bruce Bittles, chief investment strategist at Baird, said in a note. I would agree. Frankly, I would not want to be heavily invested in this stock market. It scares the crap out of me.